The M5A1 Stuart Light Tank for D-Day high chimney flues were added to the engine exhaust and air intake to enable the M5A1 Stuart Light tanks to wade ashore. 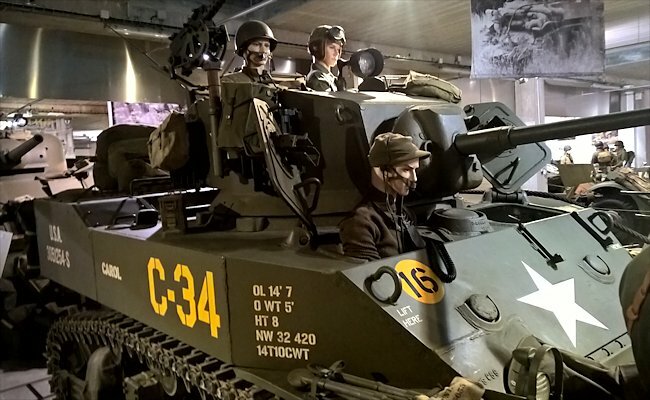 The Normandy Tank Museum is not hard to miss. It is next to the main N13 (E46) motorway. Set your Sat-Nav to the town of Catz in Normandy and then the road of La Fourchette or Rue de la Fourchette to be directed to the Museum entrance. Surprisingly this small tank had a four man crew: a commander, gunner, driver and co-driver/machine gunner. It was very cramped. It was powered by a Cadillac Twin V8 engine that produced 220 bhp. It gave the Stuart a maximum road speed of 36 mph (58 km/h). It did not have room for large fuel tanks so it only had an operational range of about 100 miles before it needed to be refueled. It was armed with a 37mm M6 Gun and two .30cal Browning machine guns. One was mounted on top of the turret and another next to the main gun in the turret. Its armour thickness ranged from 12mm to 67mm. M5A1 Stuart Light Tank was armed with a 37 mm gun. The M5 Light tank stemmed from a suggestion by Cadillac Division of GMC to the Ordnance Department that they should try the M3 light tank with twin Cadillac engines installed and the commercial Cadillac Hydramatic transmission which was produced for automobiles. In Autumn of 1941, a standard M3 was converted as a trials vehicle (the M3E2) to test the idea and proved most successful. This made a trouble-free 500 mile trial run, and the Cadillac powered vehicle proved easy to drive, and smooth to operate. Due to the always acute shortage of Continental engines, the Cadillac modified vehicle was approved for production and standardised as the Light Tank M5 in February 1942. It was originally to be designated Light Tank M4, but this was changed to M5 to avoid confusion with the M4 medium tank (Sherman), then going into production. To accommodate the twin Cadillac engines, the rear engine covers were stepped up. But the hull was otherwise similar in shape to that of the welded M3A1 apart from a sloping glacis. Turret installation, with basket and gyrostabiliser, was tested in another development vehicle, M3E3, while in the following July another Cadillac facility, at Southgate, California, also commenced production. At the same time Massey-Harris commenced M5 production in Racine, Wis, under the 'parentage' of Cadillac, and finally, in October 1943, when M3 series production ceased, American Car and Foundry also switched to turning out M5s. 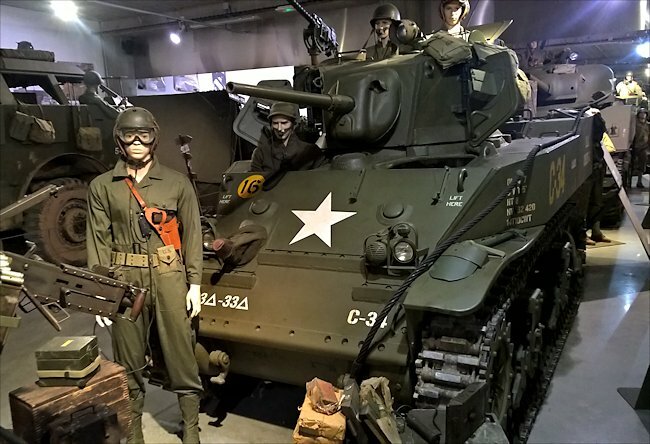 The M5A1 was designed and standardised in September 1942 to bring the M5 up to the standard of the much improved M3A3. Among changes common with the M3A3 were a new turret with bulge at the rear for a radio installation, larger access hatches for the driver and co-driver, improved mount for the 37mm gun, and improved vision devices. 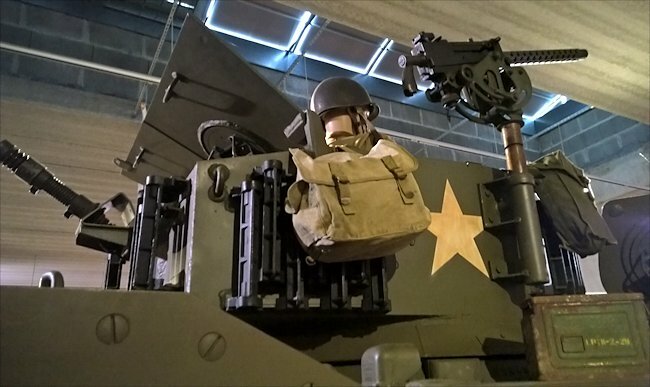 M5A1 Stuart Light Tank was armed with a .30-06 Browning M1919A4 machine gun on a mount on top of the turret. 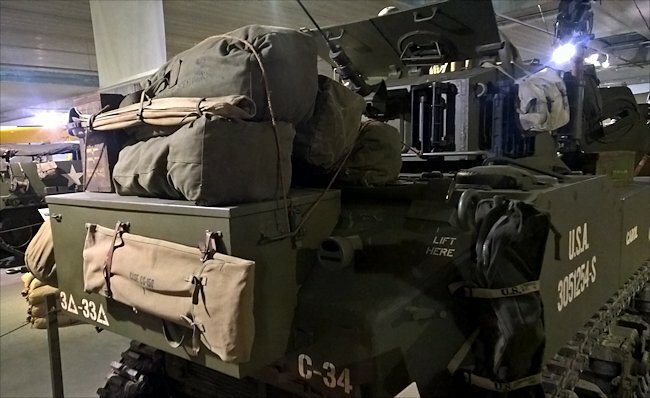 The M5 series of light tanks are most easily distinguished from M3 series vehicles by stepped up rear deck. Superior vehicle to M3 series, but not produced in such large numbers due to the appearance of the heavier M24 Chaffee Light Tank series.